Your hands play a very important role in everyday life, wouldn't you say? Without hands, holding things would be impossible. Good luck making calls with your cell phone unless you become skills at dialing numbers with your toes! Hands are one of our most judged physical features. Think about it. When you're paying for groceries at the store and digging out change from your wallet, the cashier is looking at your hands. This is one of the reasons why gloves are a must-have for every Halloween costume. You can't be fully immersed in the character if your bare hands are exposed! 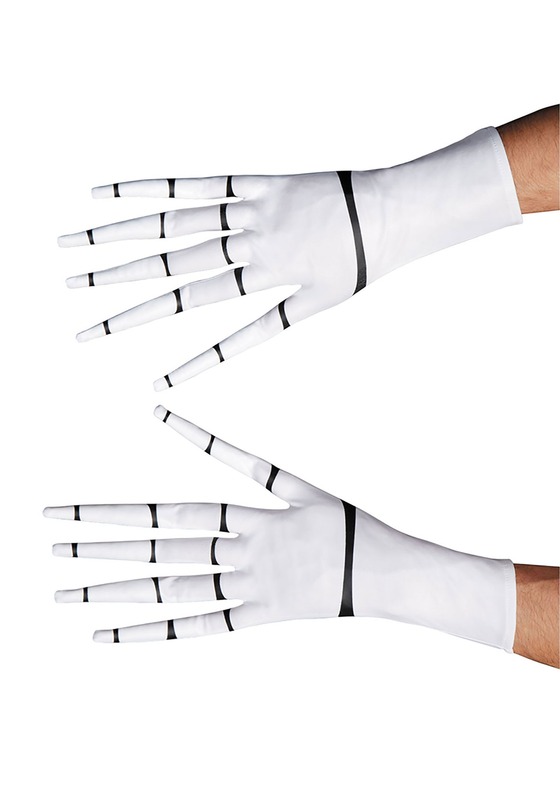 If you're dressing up as Jack the Pumpkin King of Halloween Town, then these gloves are a must-have. Get your hands on them quick before Oogie Boogie snatches them from you! The officially licensed Jack Skellington gloves for men are stretchy so they conveniently stretch around man-hands. They're all white with black horizontal lines to mimic the appearance of slender bones. Fingers are long and skinny, creating a creepy allure. They're perfect for summoning people to come closer. Now that you have the gloves, you need the full costume. We have Jack Skellington costumes for everybody!